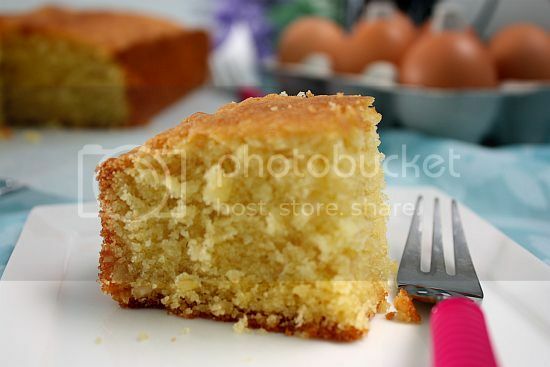 A sugee cake is really a butter cake but one ingredient that is different is the use of semolina flour. We have always associated this cake with Eurasian households and they would make this particular cake for Christmas or for wedding cakes as it is somewhat dense. It uses a lot of butter and eggs and therefore the rule of thumb is "have a small slice and don't over-indulge". If you are unfamiliar with the word "sugee", there are alternatively spellings to this word which is ‘sugi’, ‘suji’, ‘sooji' or ‘soojee’. I further discovered that the word "suji" is actually Northern Indian and the origins of this recipe may have come from there. This particular cake keeps very well in the freezer. You can also add in a bit of brandy for exra flavour but if you don't like the taste of liquor, you could add in a bit of orange zest instead. stand for an hour. This allows the semolina to absorb moisture. 2) Preheat oven to 180°C. Lightly grease a rectangular tin of 7" x 9" or an 8" round pan on the bottom and sides. Line the bottom of the tin with parchment paper. and beat at medium high speed for a full five minutes till pale-coloured. After that add in the essence and beat to combinine. combined. Then add half the flour mixture to the butter mixture and fold. ingredients are combined. Do not overmix. 6) Pour mixture into cake tin and smoothen the surface with a spatula. side of the cake and overturn it onto a wire rack to cool. water but expect a slight loss in flavour. 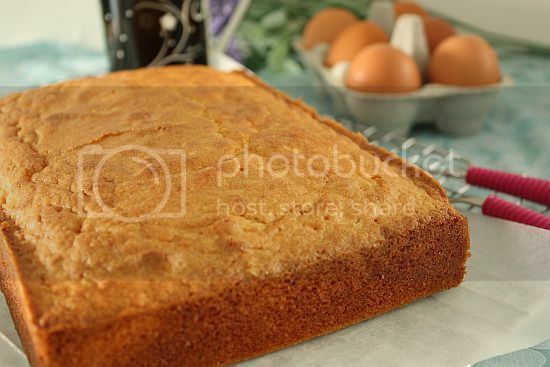 • The extra egg yolks add moisture and richness to the cake. which helps the cake rise during baking. • It is not necessary to toast the almonds before use in this recipe. 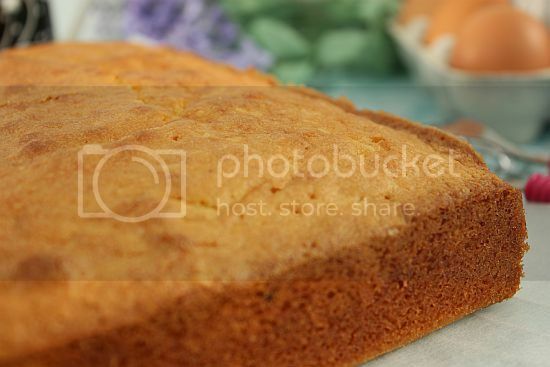 • Chopped almonds add flavour and some crunch to this cake. Do not omit. • Buy ready ground almonds and chopped almonds to save time and effort. overmix as this will result in a heavy and dense cake. Love your sugee cake! The texture looks so right! I am going to admit to something quite embarrassing... I have never had Sugee Cake. I know it is quite easily available here but for some reason, I have never felt drawn to it... if Bengawan Solo sells a small slice, I may try it first. I remember having this cake at my Eurasian friend house during Christmas. It was a rich cake. May I know if this Semolina flour is the same like the one we used for making pasta? I do have a packet of it but I am not sure if they are the same. It seems like everyone making something special for a new year. 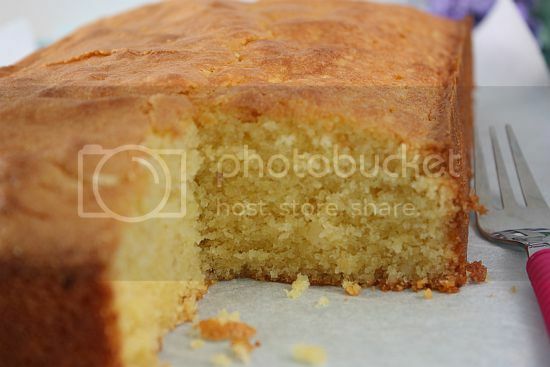 I haven't tasted this Semolina cake before, it looks tasty! You've a blessed 2011 !! Hi Busygran, thanks and I was extremely pleased with my first try at this. The cake was extremely moist. Hi Wiffy, haha now you know what the flour is for. Maybe you will give this a try next time. Hi Shirley, if you were staying nearby, I'll definitely pass you a piece. Hi ICook4Fun, yes semolina flour is sometimes used to make pasta as well because of it's high gluten. Hi KitchenCorner, like Wiffy, maybe you will give this recipe a try as well. Make a smaller portion to try out. Wonderful Cake & super lovely pics!! Is it possible for me to replace the butter with vegetable oil?? I am a jeww from Malaysia. My relatives & family were settled in Penang, Seremban,Melaka and late 70's all of us started to leave Malaysia. During our stay there we had many anglo -indian , dutch, portugese, spainish and peranakan friends. I recall many evening high teas with sweet and savory display of cakes and pastries. I recall my jewish mother baking the Semolina Cake. Mum had a variety of formula with the basic semolina cake. Soemtime she used lemon zest, some time lemon peel, orange peel or even orange peel.As for icing, she applied royal icing even fondant,orange glace and lemon glace is a good idea in terms of is color. aroma and taste . My neighbours ,I mis Aunty Caroline and Aunty Dora, both departed peacefully. My mom also passed away and laid to rest in the Penang Jewish Cemetry ( later her remains taken to Israel. I must confess, everytime I hear or smell tast the Semolina Cake. I recall my good old days as aboy running freely.I left Malaysia and now in Singapore,I baked Semolina Cake for Hanukkah and I am baking one now ( the cake is in my oven now )as it write this post. What can I say more, it is a emotionally filled feeling of missing and at the same time recalling old memories which i mis and love. As a jew born in this part of the world. i have many freinds in amulti-cultural setting. Moms Semolina Cake formula even went as far as Cochin Kerala, I baked 4 cakes at my cousin black and white house at The MattanCherry/ Cochini Jewish Community Settlement in Kerala. The Jews of Anjuvarnam have these Semilina Cake recepy too. I also saw the Dutch jews in Jakarta- Surabaya baking this cake. I baked this cake according to your recipe. It turned out great. Thanks a lot. I baked the cake today and it turned out great. Thank you! I baked the cake today n it really tastes great! Thank you so much for the recipe. If I were to bake a bigger one, do I just double up the ingredients fr the recipe? researches assistance written by " international "
additional care where good quality foods are offered. I followed the recipe but toasted the semolina and chopped almonds. Also added 2 tbs of brandy into the egg mixture. The cake turned out beautiful n the taste is absolutely amazing!!. Thanks for sharing this recipe with us. Can i use this recepie and make cupcake size sugee cakes? I would love to have the honours of meeting up with you and your family to understand your Jewish history in Malaysia. Please let me know if this is possible. Thank you.